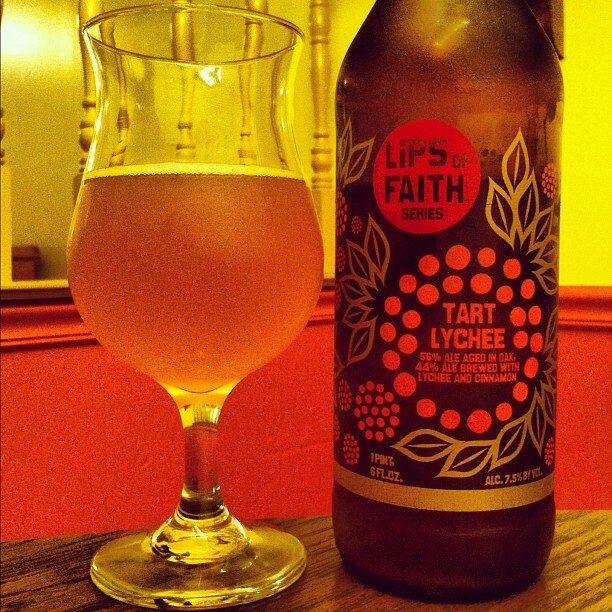 One of the latest Lips of Faith releases from Fort Collins, Colorado’s New Belgium is Tart Lychee, an American Wild Ale that is a blend of two beers — 56% oak aged sour ale, and 44% ale brewed with lychee fruit and cinnamon. New Belgium’s Lips of Faith series is for beers beyond the normal spectrum of what is considered acceptable by most beer drinker standards. This is an avenue where the company can experiment, and dedicated drinkers can delight in the science project. I know the first question I had when seeing this beer was, “What’s a lychee?” A lychee is a tropical fruit native to China, Taiwan, and Southeast Asia that has a whitish pulp with a floral smell and sweet flavor. This fruit looks like a berry, and is typically eaten fresh, since the floral/perfume aroma is lost in canning. 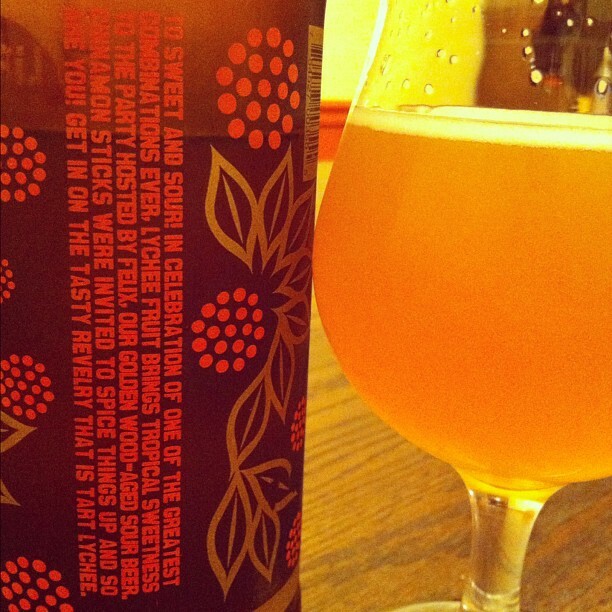 New Belgium uses a lychee puree in this beer, and the expert blenders believed the fruit to be too sweet to enjoy in a beer alone, so they decided to add some sour elements to balance things out. Yin and Yang, if you will. Tart Lychee — delivered in the visually appealing bomber bottle — comes in at 7.5% ABV (alcohol by volume) and 20 IBU (International Bitterness Units). There’s only one hop used here, which is Target, and the malt bill contains Pale, Malted Wheat, Caramel-80, Carapils, and Oats. This beer poured an average size frothy head, quickly diminishing into not even a thin cover over the drink. The beer was yellow-golden in color, more yellow than golden, and had a slightly cloudy body that had no particles or sediment (until you got to the end of the bottle, which had yeast galore, and the beer took on the appearance of orange juice). Tart Lychee left behind no lacing. On the nose, this one is fruity and sweet. Since I’ve never smelled or tasted lychee fruit, I’m guessing that is what I’m getting here — a berry/strawberry-like scent, coupled with some grain. There’s a hint of musty yeast and a solid background of cinnamon. 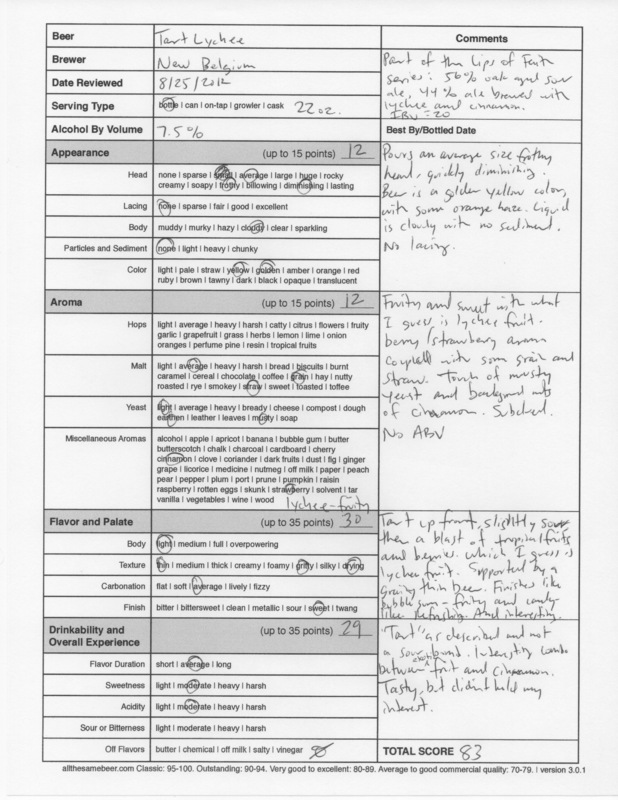 It’s a very subdued aroma, and featured no alcohol kick, even though this one begins to approach higher territory. Tasting, there’s a healthy tart kick up front, but it never turns sour. Just as advertised on the bottle — the middle of the taste turns into a sweet tropical fruit, which again I’m guessing is lychee, and it’s supported by a thin, grainy beer. The drink finishes like a piece of bubble gum, not in that classic pink flavor, but just a general tropical fruit/berry with a touch of tartness, hint of cinnamon, and some hearty grain. It’s refreshing and interesting, but it just didn’t hold my attention for long. To be completely honest with you, most of the beers in New Belgium’s Lips of Faith series have been woefully average, in my opinion. While I enjoyed Tart Lychee for what it was — a light fruity beer with a tart edge — I just don’t think it is worthy of a bomber size bottle and the price that comes along with it. Tasty, but again…didn’t hold my interest. 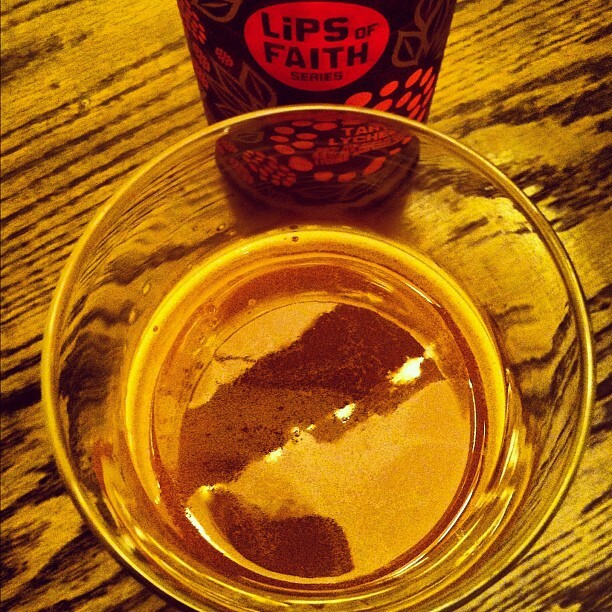 New Belgium Lips of Faith Tart Lychee, 83 points. Price: $8.95 for one 22 oz. bomber size bottle.